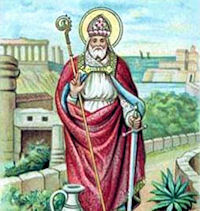 Historically today is the feast of St. Narcissus who was consecrated Bishop of Jerusalem about the year 180. He was already an old man, and God attested his merits by many miracles, which were long held in memory by the Christians of Jerusalem. The holy bishop had long desired a life of solitude, and he withdrew secretly into the desert, leaving the Church in peace. But God spoke for His servant, and the bishop's accusers suffered the penalties they had invoked. Then Narcissus returned to Jerusalem and resumed his office. He died in extreme old age, bishop to the last. For more information, prayers and pictures visit "365 Rosaries"